The repercussions of Sammy’s infection play out and Amara begins to emerge as a legitimate foe. 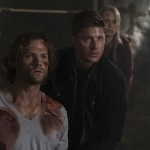 While the brothers were separated for most of the episode, the implication of what’s to come made it very clear that Sam and Dean must be joined as one force, or else Amara will engulf the world in her darkness. I appreciate that, even when Sam is dying, he takes the time to be a genius. 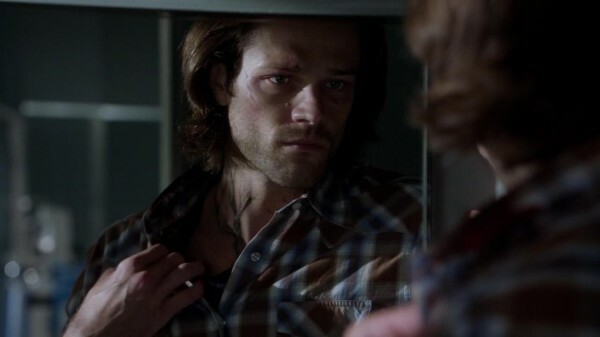 If anyone is going to be able to stop an incurable epidemic, it’s Sam Winchester. He manages to trap one infected man in Superior, Nebraska and uses him as a source of information to find out how the infection spreads and how it can be stopped. Unfortunately, it seems like there’s no pattern. As the man says, sometimes the infected turn quickly, sometimes slowly. I kept wondering if it was a sign as to the people infected — such as, maybe the ones that turn slowly are marked in other ways. We already know Sam is special; maybe the others are, too? But I didn’t really see that play out here. Instead, it’s all about the cure. He manages to figure out that Biblical purification, by way of holy oil, was the answer. First trying it on himself and verifying, he helps other infected people to be cured the same, and I assume sends them out to spread it. Well, there are a few features of the infection scenario that are surprising, including the warning of no more immortality. 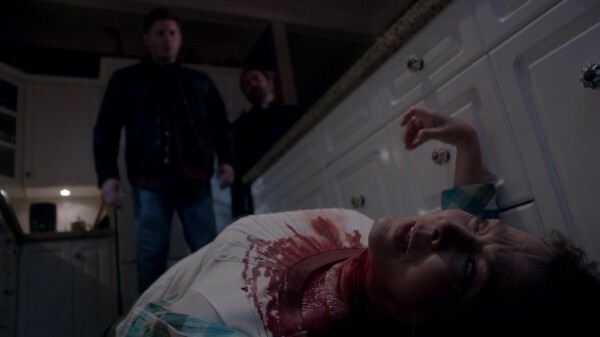 We got to meet the Reaper Billie and find out just why the Winchesters seemed to have a get-out-of-death-free card all these years. They were Death’s playthings. He was amused by them, kept bringing them back, but now that Death is dead that’s not going to happen again. Billie promises that the next time one of them dies, it’s going to be forever. And their souls are going to be tossed into the Empty where no one can escape. Now, I don’t think that the boys will die permanently anytime soon, because otherwise we don’t have a show, but it does put a bit of worry in me. 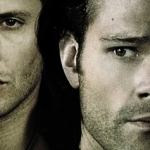 And we know how the brothers fall apart when one of them isn’t around anymore. The other surprising revelation was that Sam’s got visions again. Well, he did ask God for a sign, so there it is. His visions, however, are horrific and torturous. I’m a bit excited about the fact he has visions again, too. Not that I want him to be crippled with pain like he was when he had them before, but any Sammy powers are good for me. I hope we get to see it play out more in the coming episodes. And I hope that he reveals this to Dean, even though he hasn’t yet. Didn’t reveal his infection, either. I guess that talk about needing to change will take a while to happen. 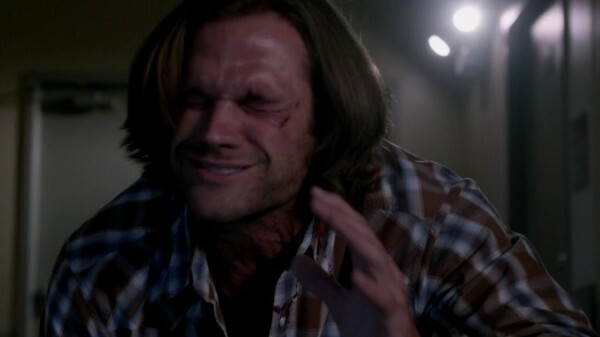 While Sam was dealing with that, Dean was dealing with Amara. He is called back to the Jenna the cop’s home because she’s noticing something weird going on with the baby. Yes, the kid is not as sweet and innocent as first thought. I loved that the baby threw the blocks at the wall to spell out “Feed Me.” It was both inventive and ominous at the same time. And, when faced with such a frightening image, Jenna’s grandmother does what any sane woman would do — she calls an exorcist. 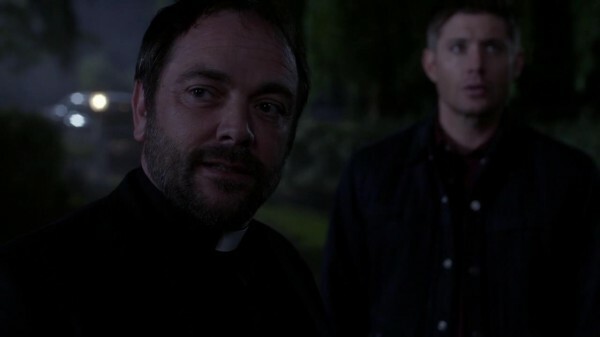 Well, turns out we know the holy man quite well, considering it’s Crowley. Hurrah! And when we get Dean and Crowley in the same place, vying for the secret behind Amara, you know we’re going to be in for a fun time. It’s a bloody scenario within the house. Jenna was affected by Amara, attacking and killing her beloved grandmother with a kitchen knife. We find out that the reason for this is because Jenna doesn’t have a soul. Amara ate it. That’s how she fuels up, and that has frightening implications for how much havoc she will cause. She’s also growing up at an alarming rate, already a child and having escaped the house before Dean can find her to kill her. Not that I think he can, since they’re bonded through the Mark of Cain, but I want to see what will happen when they meet up for real. Perhaps that will be in the presence of Crowley, since she is with him now. He tempted her with a van full of kidnapped women, a feast of souls for the taking. He’s a sneaky one, but I get the feeling trying to control Amara, or at least get her on his side, won’t end well. So, will the boys manage to figure out Amara’s secrets? And will their looming final deaths make them more cautious? 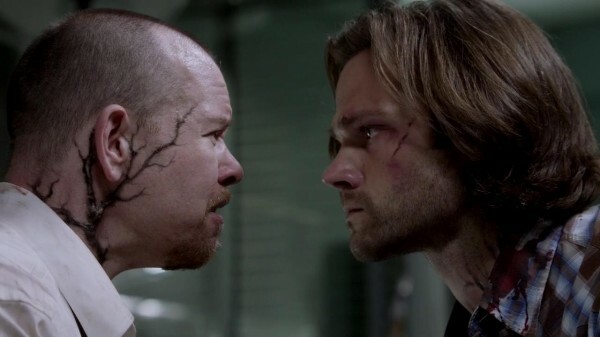 I’m not sure, but I do know that Sam’s visons have a wealth of potential for the upcoming fight. I’m very excited to find out how it will all play out!